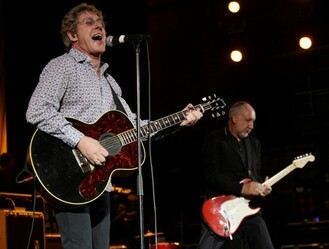 The British band had already delayed the first four concerts of their anniversary tour The Who Hits 50!, because the singer, 71, had contracted a mystery virus. They have now announced that the rest of the dates have also been called off until Roger is feeling better. A statement on The Who’s website said: “The band apologise to fans and realise that the postponement will cause an inconvenience for ticketholders. Roger said he was especially disappointed as he would also have to miss the Teen Cancer America benefit in Los Angeles, for the US version of the Teenage Cancer Trust charity, of which he is a founder. He revealed: “For the last four weeks, I have been in and out of the hospital and have been diagnosed with viral meningitis. Bandmate Pete Townshend added: “We are rescheduling all the shows for next Spring 2016.